Executive Mosaic is honored to announce Pierre Chao, founding partner of Renaissance Strategic Advisors, as an inductee into the 2017 edition of the Wash100 — Executive Mosaic’s annual selection of the most influential voices in the government contracting arena. Chao, also a managing partner and co-founder at Enlightenment Capital, holds more than 30 years of experience in management consulting, investment banking and policy expertise in the aerospace-and-defense industry to clients that include senior corporate, government and financial decision makers. Under Chao’s leadership, Enlightenment generated $147 million in capital commitments for its second fund and has invested in 11 firms across the aerospace, defense and government services sector such as Aurora Flight Sciences and Gleason Research Associates. Chao discussed investors’ hesitance on defense market investments during a Center for Strategic and International Studies-hosted forum in November that encompassed topics such as how defense contractors consider incentives as return on investment. “If you provide the right tipping point types of incentives, you will get companies to do share lines and innovate on the process side,” said Chao. 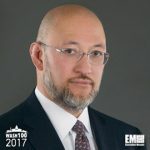 His career also includes leadership and consultant positions with the Center for Strategic and International Studies, Truman National Security Project, Channel Technologies Group, Vistronix Intelligence & Technology Solutions, KEYW, Credit Suisse, Morgan Stanley, Prudential-Bache Capital Funding and JSA International. Chao holds bachelor’s degrees in political science and management science from the Massachusetts Institute of Technology. Executive Mosaic congratulates Pierre Chao and the Renaissance Strategic Advisors team for their selection to receive this award.